Not to toot my own horn... Okay, I'm tooting my own horn. The Groundhog Day Book of Fun by (me) Wendie Old. Illustrated by that talented lady sitting to the left of me in that picture at the top right hand side of this blog, Paige Billin-Frye. Morton Grove, IL: Albert Whtiman, 2004. Still Available. If he sees his shadow -- then there will be six more weeks of winter. No shadow? Spring will come early. 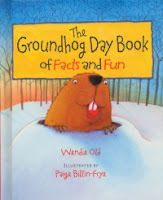 If you want to learn the meteorological basis behind this groundhog lore, you'll find it on page 25 in this book. Page 28 for a list of all the other groundhogs in the United States and Canada, and the computerized ones in Europe. Groundhog Day Party Plans-- child tested by me in library programs! Info about Groundhogs, the animal. Yes, this was a fun book to research and write. Oh -- is that a real groundhog in that picture above, perched between Paige and me? No -- It's a puppet from Folkmanis. There's a nice review of this book at Carol's Notebook . Plus a mention of it at Mary Ann Dame's blog on February 2nd, Reading, Writing, and Recipes. And lots of other Nonfiction Monday book reviews located just a click away at the Wild About Nature blog . Labels: Mary Ann Dames, Paige Billin-Frye, Reading Writing Recipes, The Groundhog Day Book of Facts and Fun, Tomorrow is Groundhog Day, Will Spring be early or late? How appropriate. I've posted about your book and linked to you on my blog, Reading, Writing, and Recipes. Forgot to mention, now I'll tweet about it. Thanks for mentioning my comments. I enjoyed the book - cute and informative.